One of the world’s most beloved body and skin care brands, Nivea knows how to take care of our largest organ – the skin. 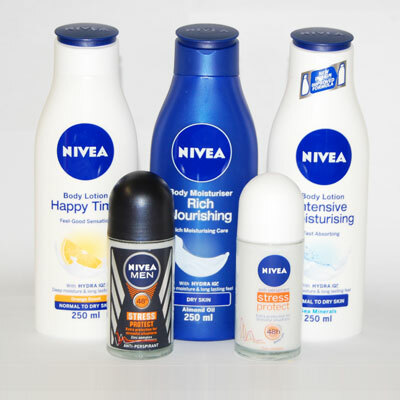 One lucky reader stands the chance to win a Nivea hamper filled with treats (and a little something for your man too!). The hamper contains a 250ml Nivea Happy Time Body Lotion, a 250ml Nivea Intensive Moisturising Nody Lotion, a 250ml Nivea Rich Moisturising Body Moisturizer, a Nivea Stress Protect Anti-Perspirant and a Nivea Men Stress Protect Anti-Perspirant. To enter, answer the questions below and submit your details.